We had amazing diving at Wolf Rock last month with large schools of eagle and bull rays in the shallow pinnacles and 20-30 grey nurse sharks at a depth of 30m. The water is warming up to 24 degrees and so the current is building with visibility 12-15m on average. 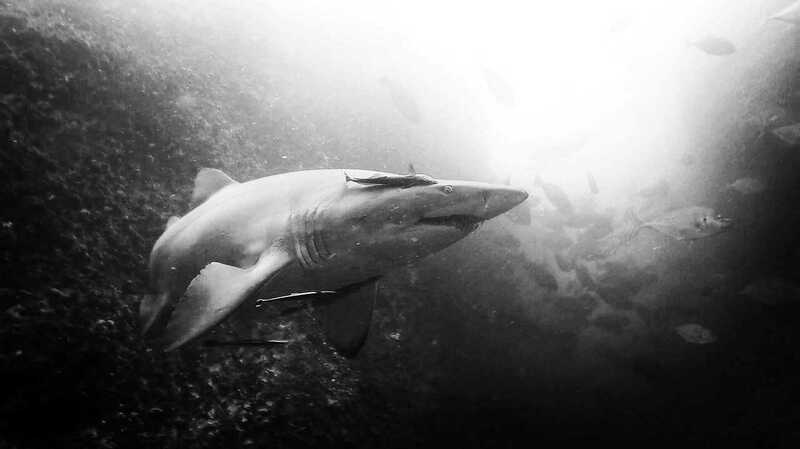 The grey nurse sharks are showing signs of mating, with white scrape marks from biting all over their bodies and heads. We expect numbers to stay high and increase over the next few months now the females remain on the Rock for their gestation period. We have successfully finished two Divemaster trainee courses. Now our certified PADI Dive Masters are moving on, we are looking for a new recruit or recruits to join our team. The PADI Divemaster course is the first level of professional training and first step into the dive industry. We run the course as an internship over 4-6 weeks, which involves lots of diving on our awesome site, as well as all duties involved in the day-to-day running a dive centre. There is minimum dive experience, qualification requirements and base fees. If you already hold a dive ticket and would like to know more, please contact the Dive Centre for full course information. Happy new year from us all at Wolf Rock Dive, and thank you for the support in our first year of business in Rainbow Beach. Two local art festivals this month!